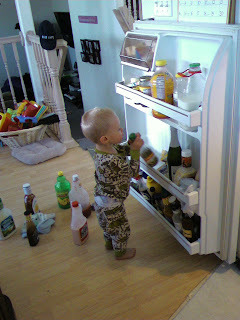 Grayson figured out how to open he fridge today. He then proceeded to take everything off the door, one bottle at a time, say "Ooooo" or "Wow!" then place it gently on the ground next to him. Then he picked them up one at a time, placed them gently back on the shelves, said "bye-bye" to them, and shut the door. I just watched in amazement and tried my hardest not to laugh. wa ahhahaha ha ha that's so so funny. Grayson is always having such a good time, no matter what! I always thought it would be great when the kids can get their own snacks out of the fridge, until they do it when your not looking...silly kids. He is so cute!! !